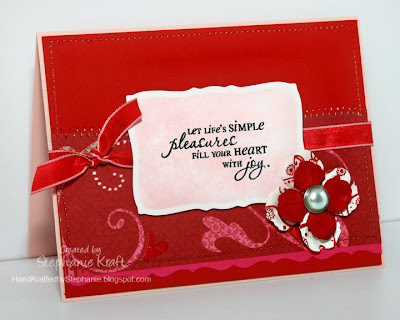 I just love this sentiment - "Let life's simple pleasures fill your heart with joy". We all get so caught up in life that I think we sometimes forget this -- I know I do. 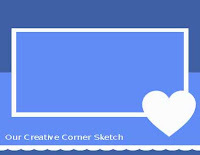 This is my card for this week's Our Creative Corner challenge, based up Jennifer's sketch to the right. This was a fun one to work with! I decided to try something new with my stitching. I replaced my thread with a red spool, but I left white in the bobbin and parts of the white was pulled up to the top for a slight 2-toned effect. It's more random than consistent, but a little bit of change. Accessories: Piercabilities Fancy Scalloped Border, Curved Rectangle Nestabilites (Spellbinders), Cuttlebug (Provo Craft); ribbon (Martha Stewart), flowers (Prima), brad, sponge, foam tape, thread, sewing machine. Love the red, so pretty, thanks for playing. Wow, this is beautiful! The reds are so vibrant. Thanks for playing along with the OCC!